There’s no wonder people call this drink an elixir. It truly is a delightful treat I am so happy to have come across and share with you. 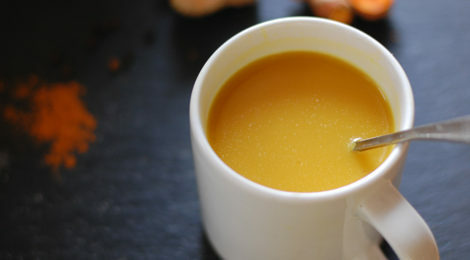 You may also have heard of this as “golden milk” or “turmeric latte”. 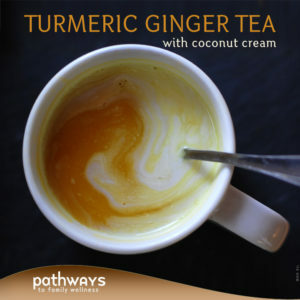 This tea is an ancient Ayurvedic concoction made with fresh turmeric, sometimes ginger and other spices. Usually it is served with coconut cream, not just for flavor, but for its ability to absorb the curcumin in the. Honestly, when I first made this I thought it was going to taste, well, not so good. Not because it’s “healthy” for you, but because I have tried making a turmeric tea before and I really did not like it. I am happy to say, I was poorly mistaken. The difference here? Fresh turmeric root, not too much cinnamon, and coconut milk all help to make it quite tasty. The combination of flavors blend beautifully to create something like a chai mixed with curry. It is a creamy, warming tea you can (and should) enjoy daily to reap its many benefits. Curcumin being the active ingredient in turmeric is known for its high anti-inflammatory, antioxidant properties. It has been shown to aid in Alzheimer’s disease and brain function as well as reduce depression and helping to prevent cancer. It is a fantastic liver detox which helps in creating a glowing complexion. Needless to say, it’s great for your health and this tea is a delicious way of incorporating it into your diet. One problem with curcumin is its bioavailability. It tends to be hard for us to reap all the benefits it has to offer. Fortunately, there has been a couple ways we can aid in this process. First, by adding black pepper with the turmeric, the bioavailability in the curcumin is increased by 2,000%, allowing us to absorb it much better. Also, since curcumin is fat soluable, it’s necessary to ingest it along some kind of fat. The addition of coconut cream allow us to absorb it even more and adds a nice taste making this not only drinkable, but quite enjoyable. I like to drink this at night an hour or two before bed. It’s relaxing, helps digestion (let’s not forget about the host of benefits from fresh ginger! ), and gives my body nutrients it loves to benefit from while I rest and restore throughout the night. Combine turmeric, ginger, black pepper, and cinnamon in a mug or french press. Bring some water to a boil using a kettle or over your stove. Fill mug/french press about 3/4 the way full (about 3/4 cup) with boiling water. Cover and let contents steep for 10-15 minutes. Strain using the french press or fine mesh strainer if desired into a separate mug. Can skip straining, but then you get bits in your mouth, which I did not care for. Mix in honey if using and coconut cream. Serve immediately.